Whether you’re moving from your parents spacious 3 bedroom, 2 bath home or you’re looking for something that’s more affordable, downsizing can be a challenge. By following a few simple strategies you will find that living in a studio apartment is a great experience. Consider the function of the things you own. What do you really use/need? What takes up valuable space? Before you downsize ask the hard questions. Then sell or donate items that no longer make sense for your new lifestyle. 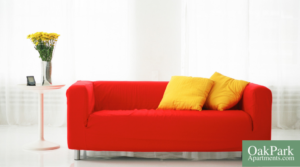 Buy smaller scale furniture. You won’t overwhelm your new space and moving will be easier. Look for furniture that will serve several functions – a couch with a pull-out bed, a tall bookcase that acts as a room divider, an ottoman that opens for storage – are all great, multi-purpose investments. Also, make sure to measure the furniture your have or are thinking of purchasing. Then measure where you’re planing on putting that piece to ensure that it will fit. Finally, measure the width of the door openings so you’re certain that the doors are big enough to fit whatever furniture you are moving before you move it. There is nothing worse then making a big purchase, like a couch, and realizing after that fact that it is too big for your space. When square footage is in short supply – think vertical. Use the height of your apartment to maximize storage possibilities. Tall bookcases, wall shelving, peg boards, hooks… are all great ways to create valuable storage. These simple strategies for living in a studio apartment will make you a believer that bigger isn’t always better!